Fall is here! And so is our new Class Schedule. We have some of our continuing groups available including Amy's Cupboard - this group meets once a month to share goodies, patterns and quilts from the 1930's, Love Letters - a Civil War group and The Farmer's Wife. Each group costs $5 each month and you can come one month or many. Other classes include Wool Stitchery, Paper Piecing, Applique, Beginning Piecing, English Paper Piecing, Buggy Barn, Purses, Flower Power and Binding. If you sign up for classes before Sept 11, you can still get our Buy One Get One Half-Off special. Other events include our Fall Frenzy from October 13-16 where you can find treats, specials and a free pattern for a Holiday project. November 5 from 7:00-10:00 is our 3rd annual Moonlight Madness. This is our Christmas kick-off party. Once again we will spotlight several guest designers, demo holiday gift ideas and have prizes and treats! Fat Quarter Friday is held once a month and all FQ's are specially priced at 6 for $11. Double Punch Day also held once a month. Birthdays - each month we have a special day to celebrate your birthday. 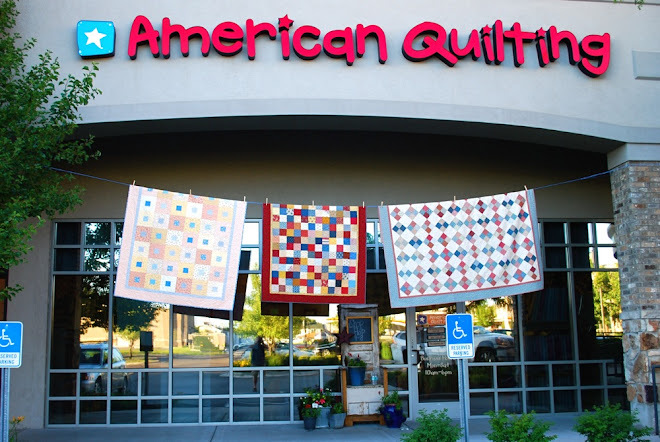 If you have a birthday that month, come in to American Quilting on the assigned day and get treats, a fun gift and a store discount! Pick up one of our calendars at the store so you won't miss all these fun events! I love the owl pattern and fabric. How can I get my hands on it?! What is the pattern name for the black, ornage and cream quilt with the stars and pumpkins on it? Would love to have the pattern.